Trust your brakes to certified professionals at Wayne Akers Ford. The brakes are your vehicle's primary and most important safety feature. The brake system consists of more than just your pads and rotors. 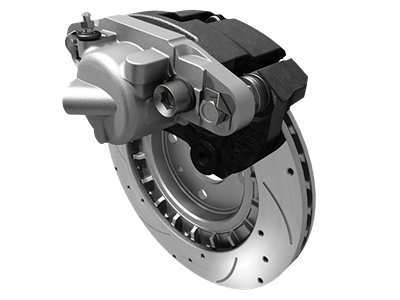 The parts of the brake system rely on one another to operate correctly. Your brakes should respond quickly when you press the pedal and stop the vehicle smoothly. If you are experiencing braking issues, a brake repair may need performed. It is vital that vehicle owners have their brakes checked and repaired as recommended. This prevents future issues by catching concerns early. Failing to correct a brake concern can cause other parts of the brake system undue stress, which leads to breakage and costly future repairs. The most common cause of brake concerns is low pad material. A vehicle’s brake pads wear away with use, and they are considered a maintenance item. It is important to have these checked regularly to ensure your vehicle has adequate stopping power. Our technicians are capable and well-trained in servicing all makes and models of vehicle. The advantage of servicing your vehicle at the dealership is that in addition to this, our certified automotive technicians are experts when it comes to your car. Where an outside repair facility may struggle with the specific design used by a manufacturer, our technicians know exactly what to do. They have worked on vehicles like yours on a regular basis and built up a wealth of knowledge on its design and unique requirements when performing a brake service or repair. Our factory trained technicians perform brake repairs on vehicles like yours every day, so you can rest assured that your brake service will be done correctly. We’ll get you in and out faster, because our technicians know what they're looking at. With us, expect quality repairs and service from a professional and knowledgeable staff. Aftermarket brake parts are tricky. Most aftermarket parts companies come up with their designs through reverse-engineering. They take apart OEM parts to see how they are built, and then come up with a retrofitted design that can work for several different models and manufacturers. This allows them to provide parts for many different makes and models, but it also results in a lower quality part. Often, using aftermarket parts results in over or under-sized parts, which can create more costly repairs later on. Another disadvantage to aftermarket parts is that they may use different materials than original equipment parts, and may wear down faster, resulting in more frequent repairs and replacements. Our dealership uses only quality OEM parts. Our customers expect professional, quality repairs that they can depend on. With the right parts and the right technicians, we’ll get your car back on the road faster and in great shape.